Many young people want to get tanned during the warmer months because they perceive that having a tan is a popular thing to do. That doesn't mean it's a healthy thing to do. While sunlight can be damaging to the skin, artificial sunlight in tanning salons can be particularly dangerous. Many teens and young women go to tanning salons. The UV radiation from tanning salons raises a person's risk of developing skin cancer, including melanoma, the most dangerous type of skin cancer. Tanning salons are not safe. Teens and others should not use tanning salons. 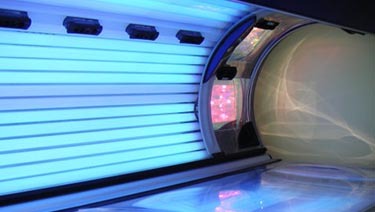 An alternative to tanning bed is sunless tanners. Sunless tanners use dihydroxyacetone (DHA), a chemical that reacts with amino acids in the stratum corneum (the top layer of skin) to form brown-black compounds, melanoidins, which deposit in skin. DHA-containing tanning preparations may be applied to the consumer's bare skin by misters at sunless tanning booths. Bronzers are water-soluble dyes that temporarily stain the skin. Bronzers are easily removed with soap and water. Because neither DHA nor melanoidins afford any significant UVR protection, consumers must be advised that sunburn and sun damage may occur unless they use sunscreen and other sun protection methods. Consumers must also be warned that any sunless products containing added sunscreen provide UVR protection during a few hours after application and that additional sun protection must be used during the duration of the artificial tan. The best advice for young people about tanning is that it is probably healthier to "love the skin you're in" rather than seeking a darker look.